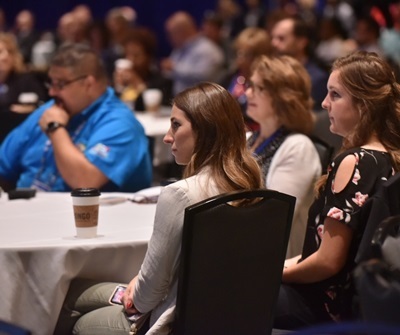 APTA's 2018 Annual Meeting attracted public transportation professionals to a wealth of educational, discussion and networking sessions. 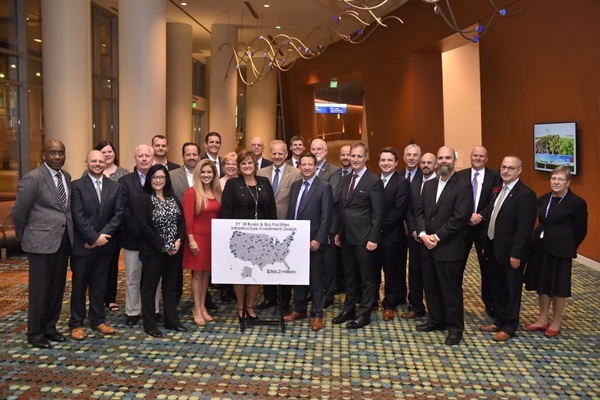 More than 1,800 industry professionals and 123 exhibitors convened in Nashville for APTA's 2018 Annual Meeting Sept. 23-26. In his first remarks as APTA chair, David M. Stackrow Sr., immediate past chair of the Capital District Transportation Authority, Albany, NY, emphasized the need for a transparent and dynamic strategic plan for APTA—on a three-year cycle vs. the traditional five to more effectively address the changing complexities of the public transportation industry; the importance of embracing and driving the new mobility paradigm; and ensuring that APTA and the wider industry continues to speak with one unified voice. APTA Immediate Past Chair Nathaniel P. Ford Sr., chief executive officer of the Jacksonville (FL) Transportation Authority, and APTA President and CEO Paul P. Skoutelas also gave remarks at the Opening General Session. In addition, Stephen G. Bland, chief executive officer of host agency WeGo Public Transit, and the Hon. David Briley, mayor of the city of Nashville, welcomed attendees to the city. Daymond John, founder/CEO, FUBU, and star of ABC's Shark Tank, provided the keynote address. Later that day, FTA Acting Administrator K. Jane Williams discussed the Capital Investment Grants Program and outlined FTA's initiatives and priorities at the General Session: FTA Update. She also attended numerous committee meetings throughout the week. You can read in-depth feature articles and view photos from Annual Meeting sessions in the upcoming issue of Passenger Transport. Watch a video of the Opening General Session here. Additional videos will be posted on the APTA website next week. APTA's 2018 Annual Report, released at Annual Meeting, can be viewed here. FTA will award $366.2 million in grants to 107 projects in 50 states and territories through its Buses and Bus Facilities Infrastructure Investment Program, U.S. DOT Secretary Elaine L. Chao announced Sept. 25. The funding supports projects to replace, rehabilitate and purchase buses and related equipment, as well as to purchase, rehabilitate and construct bus-related facilities. 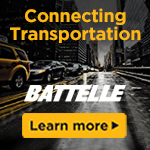 Projects to receive funding include WeGo Public Transit in Nashville, TN, which will receive $9 million to replace buses throughout its fleet; the Utah Transit Authority, which will receive $11 million for the construction of maintenance and operations buildings in Salt Lake City; and the Washington Metropolitan Area Transit Authority, which will receive $4 million to replace buses in the nation’s sixth largest fleet. The full list of the selected projects is available here. “These grants will help rebuild and modernize bus systems across the country for greater safety,” said Chao. FTA Acting Administrator K. Jane Williams met with public transportation executives at a special grant awards announcement during APTA's Annual Meeting, Sept. 25. FTA has announced that Missouri has obtained federal certification of its rail transit State Safety Oversight (SSO) Program, in advance of an April 15, 2019 deadline. Federal law requires states with rail transit systems to obtain certification by April 15, 2019. By federal law, the deadline cannot be waived or extended. Missouri DOT (MoDOT) is responsible for providing safety oversight of the Kansas City Streetcar Authority streetcar system and the Loop Trolley Transportation Development District trolley system. MoDOT is also jointly responsible with Illinois DOT for providing safety oversight of the Bi-State Development Agency's St. Louis Metro light rail system. With this announcement, 25 out of 30 states have now achieved SSO Program certification. A certification status table by state is available here. The Center for Urban Transportation Research at the University of South Florida has been tasked by FTA with conducting an independent assessment of the APTA Standards Program's policies, procedures, value and impact on the public transportation industry. APTA has volunteered to distribute this survey to its membership and non-member participants. Please help us by completing this 7-minute survey before Oct. 5. Thank you. APTA's September Transit Savings Report shows that an individual in a two-person household can save an average of $842 a month or $10,102 a year by taking public transportation and living with one less car. Click here to see the savings in the top 20 cities with the highest public transit ridership. Industry Leadership Summit with Transit Board Members Governance Workshop—NEW THIS YEAR! Purple Line Tunnel Halfway Complete in Silver Spring—State Transportation Secretary and Maryland Transportation Authority Chairman Pete Rahn and other state officials got a look at tunnel construction during a tour conducted by Maryland DOT. New Station Managers for NY MTA—New York MTA has unveiled 23 new Group Station Managers, charged with overseeing cleanliness, maintenance and customer service inside the system’s 472 subway stations. Greensboro Council OKs New Company to Manage Public Transit System—The Greensboro (NC) Transit Authority has selected Keolis Transit Services for the roughly $20 million a year contract to manage the city's bus system. Prince Harry and Meghan Markle Take Public Transportation—Prince Harry and Meghan Markle recently took the train to the Coach Core Awards at Loughborough University.